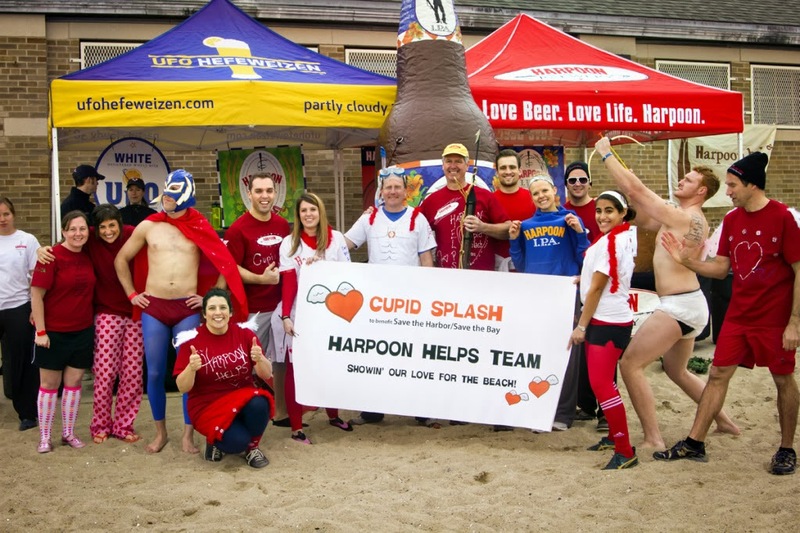 Show Your Love for Boston Harbor: Join the Harpoon Helps Cupid Splash! Looking for a way to show your love for Boston Harbor this Valentines Day? Register for the 2014 Harpoon Helps Cupid Splash, which takes place on Saturday, March 29th at the BCYF Curley Community Center at M Street Beach in South Boston. 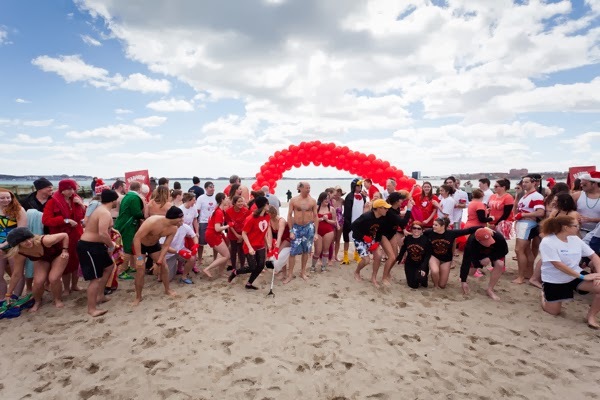 This year’s cold-weather plunge and pledge fundraiser marks the fourth annual Harpoon Helps Cupid Splash to benefit Save the Harbor/Save the Bay's Better Beaches Program and we are hoping to make it a record-breaking event this year. Once again, Harpoon Brewery will be providing refreshing beer on the beach after the big splash, and Tasty Burger will be serving up delicious burgers. Registration is open and fundraising has begun—so get signed up now to support your local beach and start working your way towards some great prizes! “We’re really lucky to have great beaches, and great partners like Harpoon Brewery and JetBlue Airways, who share our commitment to our community and our love for these beaches” said Bruce Berman, Save the Harbor’s Director of Strategy, Communications, and Programs. This year there are four ways to win a round trip ticket on JetBlue Airways! The top three overall fundraisers automatically win tickets, the best costume winners (male and female) each win tickets, everyone who makes a contribution (registration fee or pledge) is entered into a raffle to win a round-trip ticket, and everyone who raises $1000 or more wins a Harpoon Hoodie and is entered into a raffle to win a round-trip ticket. Participants who reach fundraising goals of $100, $250, $500, or more will be eligible for additional raffle prizes. Check out the Cupid Splash website for more details! "We are excited to support our friends at Save the Harbor/Save the Bay. We have been brewing on Boston’s waterfront for more than 25 years, and we believe in their mission,” said Charlie Storey, Senior VP of the Harpoon Brewery, whose philanthropic program, Harpoon Helps, is co-producing this year's Splash in South Boston. "The Cupid Splash is a great way to spend one of the first Saturdays of Spring; a quick dip into the icy water to get the blood flowing, followed by a cold Harpoon with your friends - all to support a great cause!" Last year about 200 splashers raised over $30,000 to support free events and programs on the public beaches from Nahant to Nantasket. This year we are hoping to make an even bigger splash to provide the funds for increased public programming on our beaches, organized by friends groups and other great local organizations. To register online for the Cupid Splash, visit www.cupidsplash.com. Registration is easy and provides each participant with an individualized page to set a fundraising goal and track progress, as well as a link to send to friends and family to encourage them to donate. This year there is even an option to register as a “chicken” and raise money without the actually plunging into the harbor! 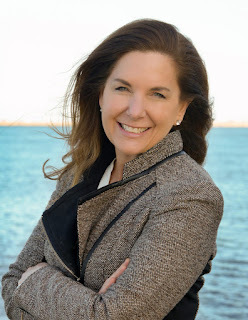 Funds raised go to support free events and programs on the public beaches in Lynn, Nahant, Revere, Winthrop, East Boston, South Boston, Dorchester, Quincy, and Hull. 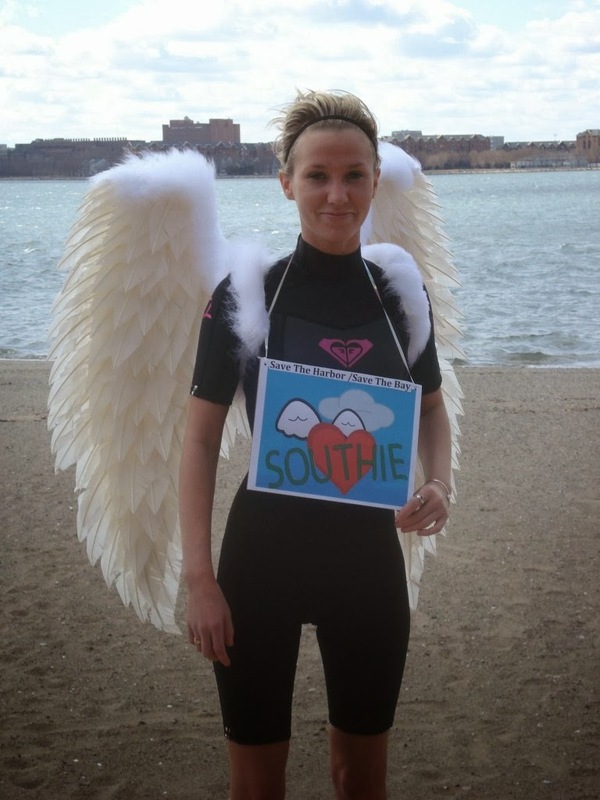 For more details about the 2014 Cupid Splash, visit www.cupidsplash.com or email Susan Woods at woods@savetheharbor.org. 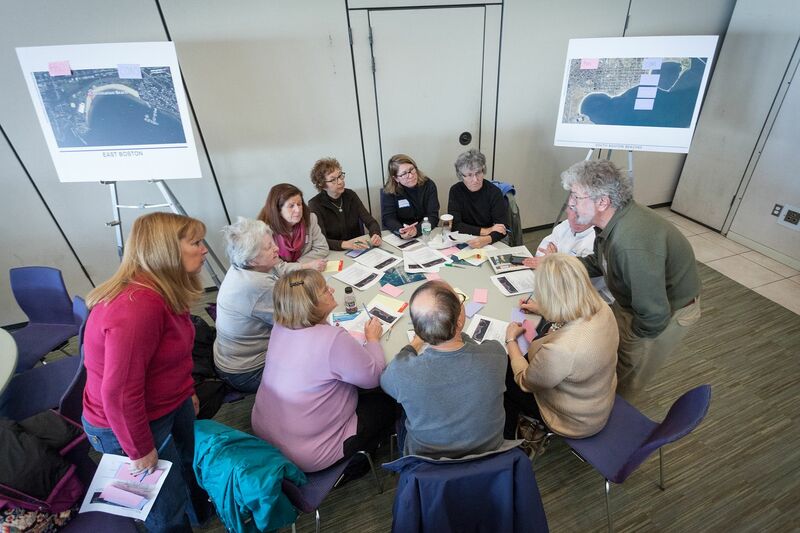 Last Saturday, the Metropolitan Beaches Commission held a public meeting to share our preliminary findings and recommendations for the harbor beaches from Nahant to Nantasket. The meeting was made possible through the dedicated public involvement of the beachfront community members and leaders, who attended the 10 public hearings that were held in each of the waterfront communities in the summer and fall of 2013 and those who participated in the MBC survey. At these hearings and in the survey we were able to hear each community’s hopes, dreams, and concerns for the future of our beaches. Save the Harbor/Save the Bay and the Metropolitan Beaches Commission used what we learned from the public hearings and survey to create a plan that will help us move our beaches from good towards great. However, before the Commission issues the plan later this year we organized this meeting so that we could circle back with the community to make sure we got it right. The meeting began with a PowerPoint presentation given by Save the Harbor/Save the Bay director of strategy, communications, and programming Bruce Berman and board member David Spillane. The presentation began by explaining where we have come from since 2007: the success we’ve had and the problems that still need to be addressed. Bruce and David addressed a number of topics ranging from DCR maintenance and beach amenities to the controversial dog and plover issues. Bruce and David concluded the presentation by addressing each beach’s unique successes, challenges, needs, and opportunities. After the presentation, everyone who attended the meeting separated into breakout groups by according to their beach. In these groups participants were given the opportunity for their voice to be heard via the sticky note system .On the sticky notes, participants wrote their desires and concerns for the future of their beach. This was a chance for every single person who attended the meeting to have influence on the MBC final report. At the meeting, you could really see how these communities truly value their beaches, and that they share our mission to protect and restore them. It was a rewarding experience for us at Save the Harbor/Save the Bay to create the opportunity for waterfront neighborhoods and beachfront communities to influence the policies that will be set forth by the Metropolitan Beaches Commission final report. 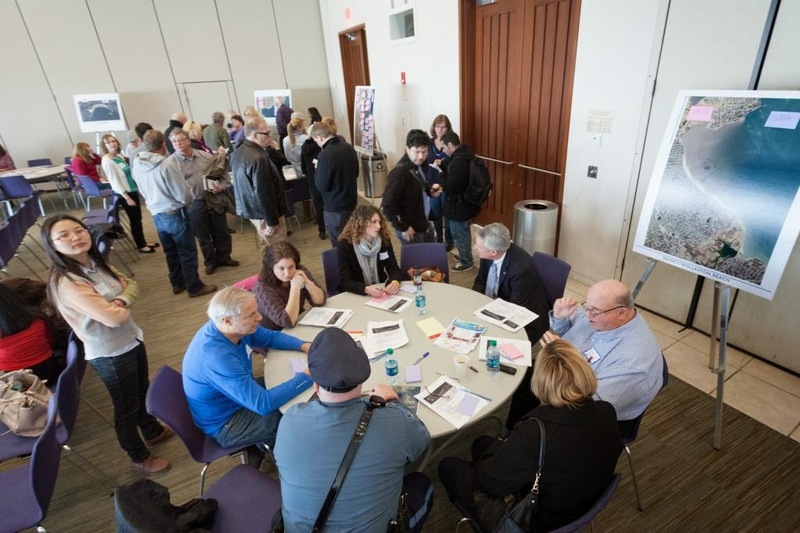 Nearly 200 beach lovers joined the Metropolitan Beaches Commission and Save the Harbor/Save the Bay at UMass Boston on Saturday, February 1, for the final public meeting to hear the preliminary findings and recommendations that will be reflected in the report to be released later this spring. It was a chance for interested individuals to give feedback and share opinions regarding the findings and recommendations concerning their beaches. 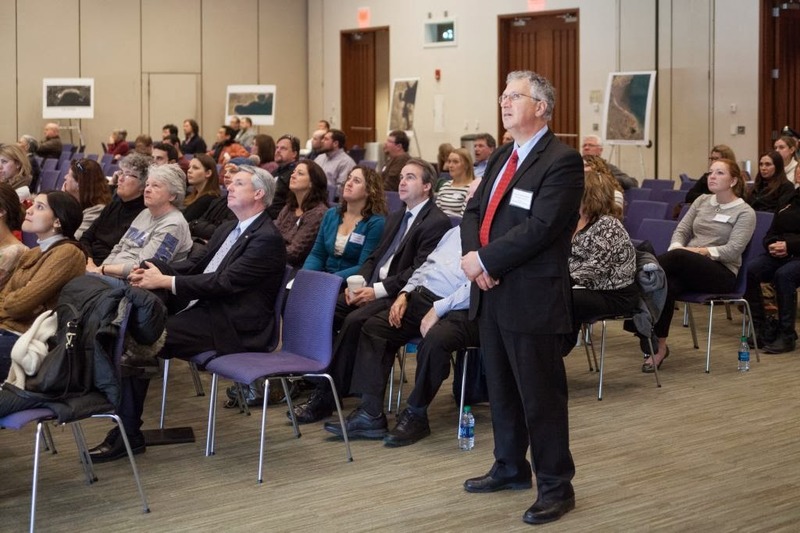 Attendees heard opening remarks from Save the Harbor/Save the Bay President Patricia Foley, Chancellor Ed Lambert of UMass Boston, MBC Co-Chair Tom McGee, and DCR Commissioner Jack Murray. To commence the meeting, attendees watched a Google earth video flyover of the metropolitan beaches from Nahant to Nantasket. The video, which provides a stunning visual of how our communities are connected by our beaches and coastline, can be viewed here. Bruce Berman and David Spillane then presented the PowerPoint detailing the progress that’s been made since the 2007 report, the Commission’s findings from community hearings this summer and fall, and the recommendations that will appear in the report. The PowerPoint is available here for download. The PowerPoint presentation gave overviews of the findings and recommendations specific to the individual beaches, but to give more attention to the individual beaches, the meeting concluded with attendees breaking into groups by community. Two-pagers detailing successes, challenges, and needs and opportunities specific to each beach community were available at the meeting, and can also be accessed online here. 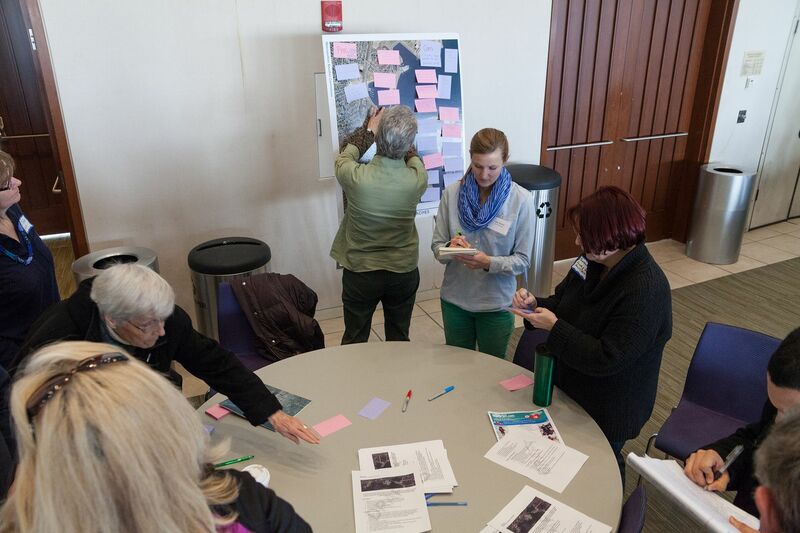 Attendees wrote positive and negative comments on sticky notes and discussed, with each other and with SHSB staff, the specific needs of their beaches. The Commission will be accepting public comments until March 1. 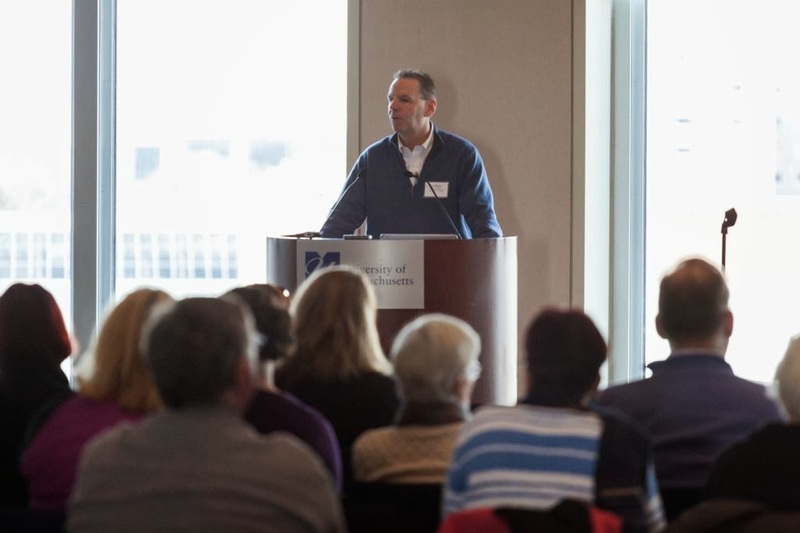 If you missed the meeting, or would like to add more feedback, you can make your opinions known by taking our survey at http://www.surveymonkey.com/s/8TH82CG or sending an email to info@savetheharbor.org.